Experience the true taste of the fresh seafood by sampling some of the finest and freshest deep sea delights along the Northumberland Coast. 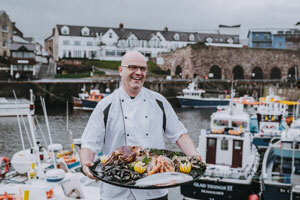 Inspired by the town’s seafood industry, head to the Northumberland Seafood Centre for the freshest catches from the cool, crisp, Northumberland coast. Continue your nautical experience with a trip to The Lobster Hatchery and local restaurants such as The Old Boathouse for a fish-tacular feast. Continue up the coast to Craster, home to the famous Craster Kipper. Head to L Robson’s, a unique family run business who have been producing some of the finest smoked Craster kippers, salmon, haddock and cod for almost 100 years. Head to The Jolly Fisherman and taste fresh catches from the Northumberland Coast in their cosy pub. Enjoy the sea views as you sample their famous crab soup. After lunch head to Dunstanburgh Castle which stands on remote headland just over a mile away, and discover the turbulent history and heritage of Northumberland. Venture to Seahouses Harbour and take a boat trip to the Farne Islands. Explore the marine life of Northumberland as you wave at the seabirds, puffins and seals who populate the islands. Sitting on the Outer Farne is Longstone Lighthouse, the home of famous Northumberland Heroine, Grace Darling. In 1938 she risked her life in treacherous conditions to rescue the stranded survivors of the wrecked steamship Forfarshire. Visit her tiny bedroom, from where she spotted the wreckage of the ship, when you take a boat trip with Golden Gate Tours. Head back in land and sample smoky delights from Swallow Fish or taste fresh catches from the North Sea at the Bamburgh Castle Inn. On the border of Northumberland sits Berwick-upon-Tweed, the Northernmost town in England. Famous for its salmon fishing history which spans over 900 years, the tradition continues on a small scale today. You can still see them fishing from June to Sept, just below the Old Bridge (at low tide), where they row out and spread the nets in the hope of a good catch. Enjoy riverside walks to spot otters and swans or head up onto the town Walls for sea views as far as Lindisfarne and Bamburgh Castles. Cast your eyes on delicious tuna and salmon or get hooked on some lesser known Northern sea dwellers such as succulent sand dab and luscious lemon sole. 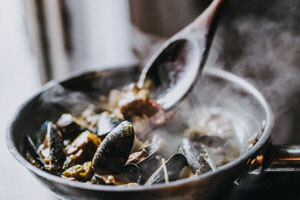 Cook up a storm in your self-catering cottage as you produce some delicious bait with seafood caught off the coast only 48 hours earlier, and net yourself some gorgeous gurnard to prepare when you get home, taking back memories of your holiday in Northumberland.